Today we are digesting something spicy for dinner. 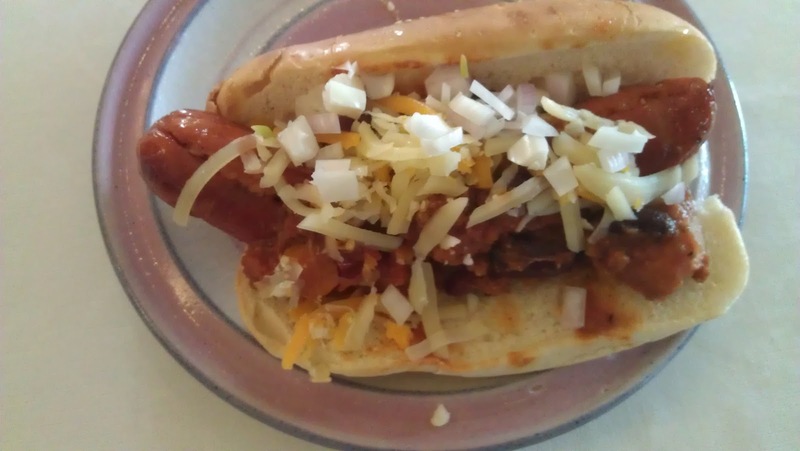 Chorizo Chili Dogs. You all know that I am a left over specialist. My crock pot has prepared many yummy dishes this week, including Pot Roast and Beef Stew. So what to do with the left overs? Chili and Chorizo is what I came up with. I mixed my leftovers together, added some more diced tomatoes, more onion and chili spices. I grilled the chorizo hot dogs, put them in toasted buns and topped them with the chili, cheese and raw onion. Nummy! Now for other news, I want to tell you about a Labor Day Blogfest and Book Fair. I am letting you know now so that you have plenty of time to sign up. Mark the dates and sign up now...Sunday September 2nd -Tuesday the 4th. (Some free eBooks included!) Wayman Publishing is holding a book fair in honor of Melynda Fleury--who has bravely been fighting diabetes and almost completely lost her eyesight--Wayman Publishing is offering unlimited free downloads of their top ten bestselling books to all entrants during this event! In addition, they are featuring some great books you should check out, one of which is the Fantasy Anthology "Open Doors." My short story, "Secrets of the Ash Tree," is included in this anthology which is being released on Sept.4th. Check out the details for that blogfest and book fair HERE! I wanted to do something special as well so I am having my own blogfest starting on Monday the 13th of this month and lasting until Wednesday the 15th. For this blogfest I want you to post about some strange and unusual place or person you have visited. A place or person that has left a lasting impression, one that you can not forget. I am curious to see where your travels have taken you and who you have met there. Come back on Monday to hear about mine. 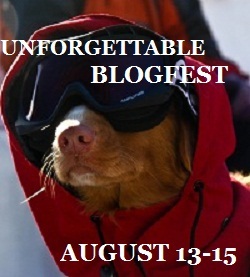 Don't forget the Unforgettable Blogfest! Here is the banner, you know what to do with it. Also, add your link to the tool below so others can visit you as well. Are you going to join the book fair and my blogfest? I hope you help me spread the word. Isn't that picture of our dog adorable? So what are you having for dinner? Don't forget to fill out the submission form for your free giveaways HERE. Hope you all have a wonderful week-end! Labels: bookfair and blogfest, free books, melynda fluery, Unforgettable blogfest, Wayman Publishing, What's for Dinner Mom? I could list many unforgettable moments. I'll see if I can narrow it down to one. I'll definitely mention your blogfest on Monday! Unforgettable moments? I'm there. I love the photo of your dog! I LOVE the banner--how fun is that LOL! Congrats on Secrets, I'm looking forward to reading it. And what a great thing Wayman is doing. I'm diabetic myself and my kidneys are starting to be affected. What an intriguing blogfest; I am totally looking foward to it! Thankfully I don't live with you Sis, my waistline would be HUGE... the dish looks awesome.